“Studies by Dr. Thabet’s team have revealed that what most archeologists took for a kind of charm, and others took for an ornament or adornment, is actually a coin. 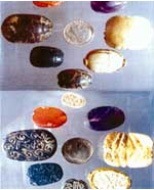 Several [facts led them to this conclusion]: first, [the fact that] many such coins have been found at various [archeological sites], and also [the fact that] they are round or oval in shape, and have two faces: one with an inscription, called the inscribed face, and one with an image, called the engraved face – just like the coins we use today,” said the report. “The archeological finding is also based on the fact that the inscribed face bore the name of Egypt, a date, and a value, while the engraved face bore the name and image of one of the ancient Egyptian pharaohs or gods, or else a symbol connected with these. Another telling fact is that the coins come in different sizes and are made of different materials, including ivory, precious stones, copper, silver, gold, etc.” the newspaper reported. One even had the image of a cow “symbolizing Pharaoh‘s dream about the seven fat cows and seven lean cows, and the seven green stalks of grain and seven dry talks of grain,” the report said. Telltale signs are everywhere -from the unexpected persistence and thickness of pack ice in the waters around Iceland to the southward migration of a warmth-loving creature like the armadillo from the Midwest.Since the 1940s the mean global temperature has dropped about 2.7° F. Although that figure is at best an estimate, it is supported by other convincing data. When Climatologist George J. Kukla of Columbia University’s Lamont-Doherty Geological Observatory and his wife Helena analyzed satellite weather data for the Northern Hemisphere, they found that the area of the ice and snow cover had suddenly increased by 12% in 1971 and the increase has persisted ever since. Areas of Baffin Island in the Canadian Arctic, for example, were once totally free of any snow in summer; now they are covered year round. Scientists have found other indications of global cooling. For one thing there has been a noticeable expansion of the great belt of dry, high-altitude polar winds -the so-called circumpolar vortex-that sweep from west to east around the top and bottom of the world. Indeed it is the widening of this cap of cold air that is the immediate cause of Africa’s drought. By blocking moisture-bearing equatorial winds and preventing them from bringing rainfall to the parched sub-Sahara region, as well as other drought-ridden areas stretching all the way from Central America to the Middle East and India, the polar winds have in effect caused the Sahara and other deserts to reach farther to the south. Paradoxically, the same vortex has created quite different weather quirks in the U.S. and other temperate zones. As the winds swirl around the globe, their southerly portions undulate like the bottom of a skirt. Cold air is pulled down across the Western U.S. and warm air is swept up to the Northeast. The collision of air masses of widely differing temperatures and humidity can create violent storms-the Midwest’s recent rash of disastrous tornadoes, for example. Sunspot Cycle. The changing weather is apparently connected with differences in the amount of energy that the earth’s surface receives from the sun. Changes in the earth’s tilt and distance from the sun could, for instance, significantly increase or decrease the amount of solar radiation falling on either hemisphere-thereby altering the earth’s climate. Some observers have tried to connect the eleven-year sunspot cycle with climate patterns, but have so far been unable to provide a satisfactory explanation of how the cycle might be involved. Pope Benedict gave US President Barack Obama a surprise gift of the Vatican bioethics document “Dignitatis Personae,” and discussed the ethics of abortion and embryo research in their first meeting in Rome this afternoon. A lengthy live feed video of the meeting showed a relaxed Obama greeting the pope warmly and sitting down immediately at his desk to a conversation that began with the recently concluded G-8 summit meeting in the earthquake-struck city of L’Aquila. “Dignitatis Personae” (On the Dignity of Persons) is a 2008 instruction by the Congregation for the Doctrine of the Faith that gives the Catholic teaching on the ethics of embryonic research and reiterates Church opposition to contraception and abortion, mentioning new methods of birth control such as female condoms and the morning-after pill. Barack Obama told Pope Benedict XIV it was “a great honor” to meet him in what may be one of the US President’s most successful PR ventures in his presidency to date. The meeting in the pope’s private office lasted forty minutes and consisted of what White House spokesmen described as “frank but constructive” private discussion on world issues. After eight years of friendly Vatican relations between former President George W. Bush, observers have eagerly awaited this meeting. Despite differences between the Bush administration and the Vatican on the war in Iraq, the former president’s relationship with the Catholic Church was strengthened by his initiatives in defence of human life. With Obama’s zealous support for legal abortion, even to the point of having opposed legislation to protect children born alive after failed abortions, it is expected that tensions with the current administration will be higher. The Vatican has made unusual accommodations for the visit, scheduling it in the late afternoon before Obama proceeds to a visit to Africa and allowing extensive live video coverage. The Vatican normally schedules such meetings for midday. “And it came to pass, when midday was past, and they prophesied until the time of the offering of the evening sacrifice, that there was neither voice, nor any to answer, nor any that regarded. Just a few years before this showdown on Mount Carmel, Israel had been lush with prosperity and wealth. King Ahab had led the Israelites on a path that led farther away from the old, established worship of God than any before him, and had brought them to a life of riches, prosperity, and licentiousness. The gods that he and his wife Jezebel had enticed the people of God with appealed to their earthly and fleshly desires. No longer did they have to be constricted with an old religion that demanded holiness and the fear of the Lord. No longer did they have to lead a life of separation from the things of the world that other, more prosperous nations enjoyed. They could enjoy the prosperity and fullness of riches without the constraints of a religion that had become outmoded and old-fashioned. Life was good. So when Elijah pronounced the judgments of God upon Israel, they laughed him out of the king’s court. The true prophets of God had been eradicated from the public place and were no longer a thorn in the side of everyone who wanted the rewards of love, peace, and prosperity. You were no longer allowed to mention the name of Jehovah, much less pray to him in a public place. They now had priests and prophets of Baal that had replaced those old critical and judgmental men who had caused such consternation in the land. Elijah had stood as the one, lone voice who cried for a return to righteousness. And who was this hairy old man? He didn’t seem to be of any real consequence. He had no credentials, no theological bearing, and no consequential importance. Even his dress revealed his lack of social prominence and his irrelevance in such a modern, sophisticated time as this. Ahab’s ears may have been deaf to Elijah’s pronouncement, but when Elijah spoke, God listened. The Ahab’s court may have derided him with laughter as he stood before the king, but 3 years later, no one was laughing. We have followed a course similar to the one that Ahab had led Israel down. The Gospel we listen to is far different than the Gospel our grandfathers believed in. We decry the old brush arbor revivalists as hard, judgmental men who did not understand the love of God, and we have traded their message of repentance and holiness for one that is a kinder, gentler approach which promises love and peace and prosperity. But the love, peace, and prosperity that our modern prophets have promised us are but a worldly shadow of that which God offers us through a walk of righteousness in the fear of the Lord. We have been like the Israelites at the foot of Mount Sinai – we feared and trembled at the presence of God when the mount shook with fire and smoke, but as soon as Moses departed up the mountain and we were left to our own devices, we made for ourselves a golden calf to worship in God’s place. I have said for 7 years now that something is coming to America that will be far worse than 9/11, but I never knew what form that judgment would take. Would it be a dirty nuclear explosion in one of our cities, or an epidemic, or some natural disaster? We would be hurt, but it wouldn’t take long to go back to our old ways. We are the great and mighty America, and we have an innate belief that we will always bounce back and dominate. What if it wasn’t any of those imagined disasters, but something that struck right to the heart of that which we cherish the most? What if we lost our prosperity and wealth? And what if it consumed every level of our society and every part of our country? We are living in that time of drought when the ravens fed Elijah by the brook Cherith, right after he fled the king’s court. We look to our televangelists who promise us blessings, and refuse to consider that our lust for those promises is what has led us to this drought in the first place. But we still flip on the TV and hope for a word of encouragement that will convince us to hang on to a Gospel that has a form of godliness, but denies the power thereof. And of course, they tell us exactly what we want to hear, along with an encouragement to send them your money so that God can release His blessings all over you – but never a word of reproof or repentance. The job of a prophet is not to tell you how beloved you are, how many blessings God wants to bestow upon you, or how much love is in your church. The job of a prophet is to rebuild the old broken down altars of God and declare unto the people of God their sins and transgressions so that they may come to a place of repentance and, once again, return to the true God of Israel. “Because thou sayest, I am rich, and increased with goods, and have need of nothing; and knowest not that thou art wretched, and miserable, and poor, and blind, and naked: I counsel thee to buy of me gold tried in the fire, that thou mayest be rich; and white raiment, that thou mayest be clothed, and that the shame of thy nakedness do not appear; and anoint thine eyes with eyesalve, that thou mayest see.